You’ll be forgiven if you initially mistake the Toshiba hybrid running Fliqlo for the iPad, but the iPad is covered under the red smart cover on the right side of the desk. It looks like there’s an LED light strip behind the desk too, which is a great way of bringing some nice ambient lighting to any desk arrangement. What fun it would be to be a student in this day and age. There are so many tools available – this is a very nice and useful set up. This is far from a Mac Setup. He’s got an obsolete MacMini, and an iPad 2 but he’s got a current Windows 8 thingStickamabob? a bunch of accesories hardly makes this a “Mac” setup. You guys must be desparate. Stick to tips and tricks. Your opinion is lame, keep it to yourself. I like these posts. Keep them up OSXDaily! I’m replying to this comment on an “obsolete” MacBook Air becauase obviously anything that isn’t brand new is “obsolete” according to this guy! I believe he means obsolete because it’s Power PC and not Intel. It’s a BenQ monitor (hardly a Thunderbolt or even a Cinema Display) and I have no idea what a Windows 8 slider is all about; Windows 8 running in a Parallels Desktop VM would be another thing completely. That said, the owner is just a struggling student. No offense to Alex, but let’s take it easy on Jason, too. Everyone has a right to express an opinion without a Spanish Inquisition. Welcome to OSXDaily. You don’t have to like everything we post, but we’ve been running weekly Mac Setups since 2009 and will continue to do so. So, only because it’s an older model it isn’t a Mac setup? I see a Mac Mini, I see Mac OS running on the monitor, I see an iPad and some other stuff, which makes this… well, a Mac setup. Is this website only allowed to post the most expensive setups with the most expensive furniture, screens and latest generation Macs? Yes, his hardware is a few years old, but does that mean this isn’t a Mac setup? Actually, he has more Apple hardware than some other Mac setups. In your opinion a picture of just one retina MacBook Pro is a real Mac setup, while the above setup isn’t? Let everyone choose his own hardware. Several cheaper and older devices are more of a Mac setup than just one expensive Mac of the latest generation. Besides, the fact this person is proud of his old hardware actually proofs this is a real Mac setup. Do people make pictures of their 10 years old Windows PCs? No, they don’t care about them. Macs are so nice this person is still proud of it and you just have to admit it still doesn’t look outdated at all. I also have to say his Mac is actually a real Mac. It has a PowerPC CPU, which actually makes it more of a Mac than those modern Intel Macs. Then there’s the tablet running Windows 8. Yes, indeed, it’s there, but does that make this whole not a Mac setup anymore? A lot of Mac users (maybe even most of the Mac users) even run Windows in some way: Bootcamp, virtual machine, dedicated PC. Are all of these not Mac setups? This is by far the most interesting “Mac Setup” I have ever seen. Love the tech over different gens working together. Also love that there is some variety (not just Apple products). Well, everyone is proud of what they have. Sure, it isn’t the most cutting edge mac setup but still it’s a functional ecosystem and I applaud the guy. Have a good time with your machine! Everyone is so fussy about the setup because he has a Windows computer in there too, but who cares? Why don’t you send in your picture if yours is so much better and Windows-free? Now THAT’S a nice setup. Congratulations on good stuff, well-chosen and displayed. More important, it’s good enough to the most any job done! The list says “magic mouse” but isn’t that a “mighty mouse”? Wow… an old Mac mini with powerpc! Can anyone tell me what the clock in the left side of the picture is? Now most of the work are done with computer :], so this is perfect place to work ! Great setup. Proves that Macs will always last longer than Windows, with the PPC Mac Mini around. I also have a PowerBook G4 that’s still fully functioning. 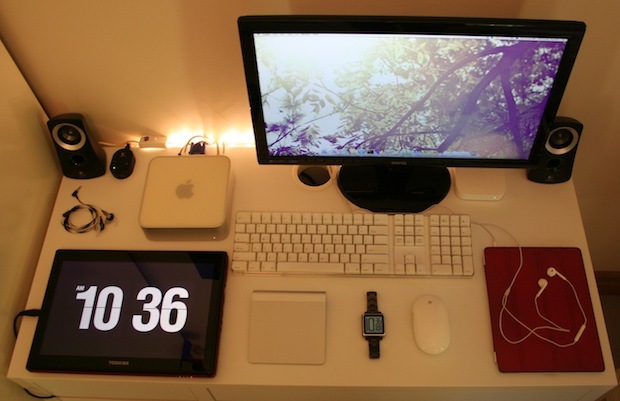 Love the simplicity of the setup. Mine’s a complete mess with wires everywhere.